Do you like baking? Gardening? Meeting new people? Have spare time? Or perhaps have a community idea we can help you develop? Then we’re a match made in heaven! We have a number of volunteers who help us run Cafe 1759 on a day to day basis. 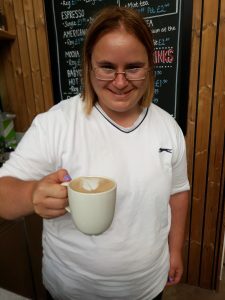 They help us in both front of house – using the till, coffee machine, serving customers and clearing tables – and in the kitchen with food preparation and general duties. All of our volunteers have completed various training courses, including food hygiene, barista coffee training, fire safety and first aid. We want our volunteers to develop the skills and confidence to move onto employment or training – if that’s their goal. You won’t need previous experience and we’ll give you support, training, a reference and invitations to volunteer social events. We have a great track record of supporting volunteers. We opened the Round About Café in Mansbridge, Southampton in October 2013. Since then, more than 30 volunteers have come through our doors; 11 of whom have moved onto paid work. If you’re interested, please get in touch with us to find out more. Do you ‘grow your own’ and find you often have some to spare? We’d love to use local people’s produce in the cafe – get in touch if this is something you can help with.